We use algebra quite frequently in our everyday lives, and without even realizing it! We not only use algebra, we actually need algebra, to solve most of our problems that involves calculations. Here are some simple examples that demonstrate the relevance of algebra in the real world. You purchased 10 items from a shopping plaza, and now you need plastic bags to carry them home. 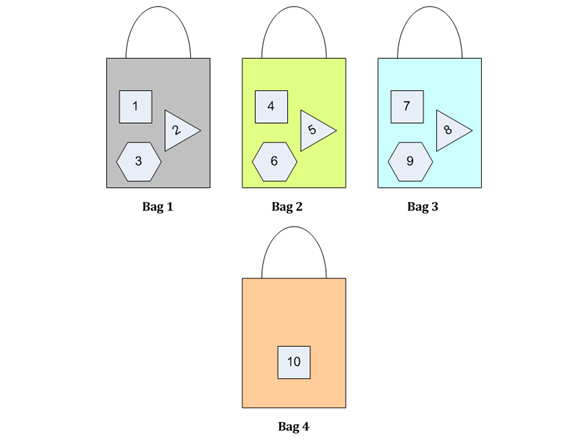 If each bag can hold only 3 items, how many plastic bags you will need to accommodate 10 items? The different shapes inside the bags denote different items purchased. The number depicts the item number. We use simple algebraic formula `x/y` to calculate the number of bags. So,we need 4 shopping bags to put 10 items. You have to buy two dozen eggs priced at $10, three breads (each bread is $5), and five bottles of juice (each bottle is $8). How much money you will need to take to the grocery store? The figure below shows the three items in different shapes and colors. This will help your mind to calculate faster. We will use algebra to solve the problem easily and quickly. You need to fill the gas tank but you have only $15 in your pocket. If the price of the gas is $3 a gallon, how many gallons can you buy? In the below diagram, each block represents $1, and each row is a bundle of $3, which is used to buy 1 gallon of gas. We use simple algebraic formula,`x/y` to calculate the total gallons that can be bought. So, with $15 we can buy 5 gallons of gas. Life's many problems are disguised in the form of math equations, and if we know the math, it's fairly simple to solve those problems. Find three consecutive numbers whose sum is 216. The task is to find three consecutive numbers whose total is 216. A group of 5 boys goes to the theatre for an evening show. The total cost of ticket is $55 and popcorn is $25. What is the cost per person? A group of 5 boys goes to the theatre. The cost of ticket and popcorn is $55 and $25 respectively. What is cost per person? $80 is the total cost. The area of a rectangle is 72`cm^2`, in which the width is twice its length. What is the dimension of the rectangle? The area of a rectangle is 72 cm. The width is twice its length. What is the length and width of the rectangle?